PREVENT compliance issues by investing in a compliance management system. PROTECT your employees and your business by investing in an identity theft protection program. PRESERVE your assets by investing in a quality cyber liability insurance policy. ALAcyber.com. Take the 8 question Information Security Compliance Quiz to get a quick view of the roughly 80 compliance requirements and best practices your firm should be following. According to Javelin Strategy & Research's 2018 Identity Fraud Study, the total number of identity fraud victims increased by 8% in 2017, rising to 16.7 million U.S. consumers. In today's world, it's not so much about if you, your business, or someone you know will become a victim of identity theft, but when. iDefend® can help. iDefend® provides you with the key areas of protection you need to help defend yourself, your family, your business, and your employees against today's identity thieves and cyber-criminals. In short, it's WHOLE identity protection to help protect against all types of identity theft and fraud that put your privacy, your money, and your future at risk. iDefend® Business is the industry leading business identity theft protection program, providing you with the critical tools and resources you need to protect your business ─ and you as the owner ─ in a simple, affordable plan. iDefend® Employee provides your employees with identity theft monitoring, credit monitoring, privacy protection resources, lost wallet protection, full ID theft recovery service, and $1 million service guarantee. The threats facing your employees have changed. Has your benefits package? 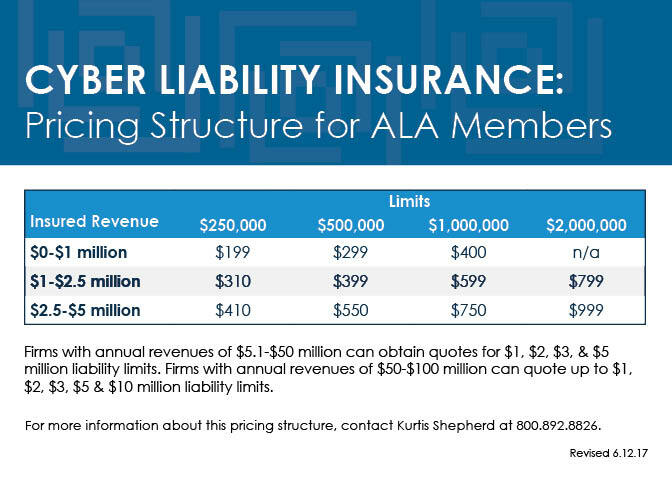 With an average cost of $201 per compromised record, a breach can be potentially devastating to your organization.1 While traditional insurance policies have significant gaps in coverage for digital exposures, a Cyber Liability Insurance Policy helps to fill in those gaps by providing liability coverage to an organization specific to cyber and privacy breaches. PRICING: Special pricing available for ALA members. Check out the pricing structure. COVERAGE: Broad coverage language for Regulatory Claims, Business Interruption & Digital Asset Restoration, Cyber Extortion, Multimedia Liability & Privacy Breach ─ all coverages offered at full policy limits. HOTLINE: Access to 24-hour data breach hotline to report incidents with Baker Hostetler, one of the leading Cyber Breach firms in the country. Visit BreachPro.com to learn more about how BreachPro can assist you with your Cyber Risk Management needs. Check out the Resource Center for more articles and educational material on Cyber Risk Management topics. For more information, contact BreachPro at 1.888.835.0850 or at [email protected].